Iraq's National Museum has reopened nearly six years after it was looted and vandalised in the aftermath of the 2003 US-led invasion. Thousands of its antiquities were stolen at that time, and only about a quarter have since been retrieved. Coalition forces had no orders to intervene, and stood by as Iraq's priceless heritage was pillaged. Many of the nation's treasures were in the museum, and analysts decried its looting as scandalous. 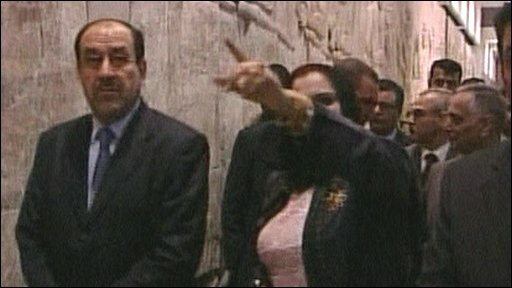 Prime Minister Nouri Maliki was at the opening ceremony inside the museum, and described what had happened there as Iraq's "dark age". "I'd like to offer my sincerest thanks to all the countries which stood by Iraq, whether through their contributions towards rebuilding this museum or returning the smuggled artefacts," he said. "We want to make our museum a place which will be at the forefront of international museums. There's a long road ahead of us." It is estimated that about 15,000 artefacts and antiquities were stolen in the chaos that accompanied Saddam Hussein's ousting. Only about a quarter are believed to have been retrieved, despite international efforts to ban their trafficking or sale. The museum itself reopened symbolically for a day in July 2003 to show that some of its riches remained - but it had remained shut since then. The BBC's Jim Muir in Baghdad says the reopening is part of the Iraqi government's drive to show that life is returning to normal. But our correspondent says it is a controversial step, with several prominent Iraqi experts, and even officials from the ministry of culture, criticising what they regard as a premature move. They say little of the museum's vast collection has been properly catalogued or displayed, and that a lot more work needs to be done before it is up to modern standards. Meanwhile a roadside bombing in central Baghdad killed at least two civilians and wounded six other people, including two police officers, on Monday. Officials say the bombing was aimed at a police patrol.